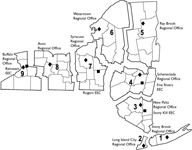 DEC invites the public to comment about draft work plans to investigate and take measures to address contamination related to the 113-117 Clinton North Site (Rochester, Monroe Co.), within New York's Brownfield Cleanup Program. Public comments about the draft plans will be accepted through January 5, 2018. Click the web link above at "Additional Information" to learn about the draft plans and how to comment. Project documents can be reviewed at: Central Library of Rochester and Monroe County, 115 South Avenue, Rochester, NY 14604; phone: 585-428-7300.